Cedarville University student-athletes will travel more cost effectively and securely this year after the university purchased two 40-seat busses. The new vehicles arrived in late August and have already been used by athletic teams. 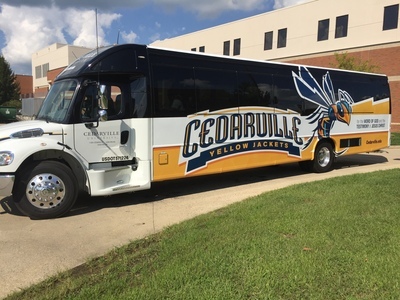 The acquisition took more than a year of planning and budgeting, and marks a significant improvement for Cedarville’s Yellow Jacket athletic teams, which previously used chartered buses for long trips. The switch to owning busses will save the athletic department thousands of dollars. Weinstein, Mark D., "New Wheels for Cedarville Yellow Jackets" (2016). News Releases. 322.